Strieffer seems to be arguing albeit implicitly that words should have precedent over actions when trying to divine a person’s actual beliefs. He has in the past pointed to the language in the regulations governing the use of some animals in some research that appear on the surface to imply some ethical weighing. In actual fact, ethical weighing occurs rarely in research using animals but is overt and required in research using humans. See my essay The Ethics Underpinning Oversight, November 28, 2010. Streiffer seems to imply that in most instances researchers may believe that the harms to the monkeys and other animals are not very great. But if this is true then they must be ignorant of the use of monkeys on the whole because even monkeys not used in an experiment suffer from chronic diarrhea and signs of confinement-induced stereotypic behavior (pacing, spinning, odd postures, over-grooming, etc) and self-mutilation. Just keeping monkeys in the typical laboratory setting is clearly and demonstrably harmful to them. See for instance "Stereotypic and self-injurious behavior in rhesus macaques: a survey and retrospective analysis of environment and early experience." Lutz C, Well A, Novak M. American Journal of Primatology. 2003. But maybe they actually do recognize that the harm is great, which I believe even a casual observer would recognize. If the harm is great, it appears that only Streiffer’s third point could salvage his claim that vivisectors don’t consider the monkeys used to have a very low moral status: (c) their beliefs about the value of the research. Keep in mind that the pro-vivisection organizations argue that essentially all medical progress is due to animal experimentation, and whooping cough is no exception. (Just Google whooping cough animal research.) The whooping cough example has implications for the larger question at hand, namely the actual opinions of vivisectors vs their claimed opinions. I will come back to this later. 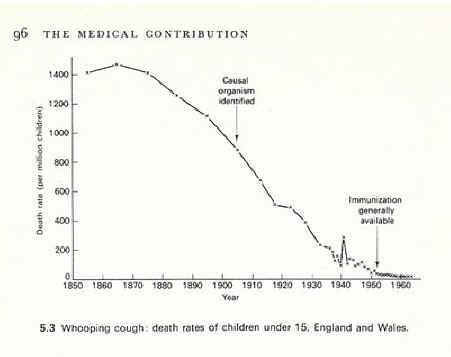 In the meantime, consider the dramatic decline in mortality that occurred in the nineteenth century prior to any meaningful medical therapy or prophylaxis, or even knowledge of microorganisms, as a sort of bookend to the history of modern public health advancement, at the other end, is the modern critique of the basic research enterprise. Does animal experimentation inform human healthcare? Observations from a systematic review of international animal experiments on fluid resuscitation. Roberts I, Kwan I, Evans P & Haig S. BMJ 2002.